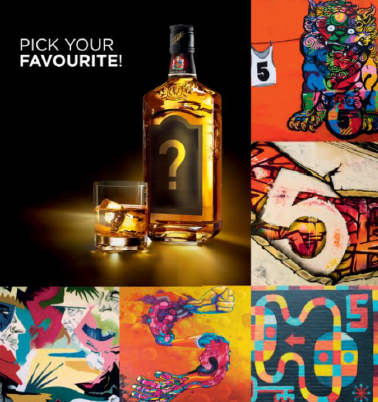 Blended Scotch whisky brand Label 5 is asking its social media followers to pick next year’s limited edition label, based on artworks created by five street artists. Earlier this year, the La Martiniquaise-owned brand recruited five street artists to create a series of graffiti artworks for its Power of 5 campaign, in key cities around the world – London, Beirut, Brussels, Hong Kong and Mexico. For example, the brand partnered with UK artist David Shillinglaw, who designed a colourful mural in London’s Brick Lane that features floating hieroglyphics inspired by the number five. Rami Mouallem took inspiration from the busy nightlife of Lebanese capital Beirut for his piece, while in Mexico City, N30, Mocre and Mil Amores produced an installation depicting the solidarity that followed an earthquake that rocked central Mexico in 2017. The five graffiti artworks created for the street art activation will compete during a digital contest starting on the 18th October across social media, with followers invited to “like” their favourite design. The most popular will become the label for next year’s street art limited edition release.